Egypt may purchase $2 billion in weapons from Russia—a deal which could be underwritten by Saudi Arabia. Cairo has its eyes set in particular on a batch of MiG-29 interceptor jets. What are the motives of the players? The Egyptian military gains a new source of arms and aid after losing some U.S. support in the wake of Muhammad Morsi’s fall from power. Russia gains financially through the sale and politically by further reestablishing its influence in the Middle East. Saudi Arabia gets another way of expressing its dissatisfaction with U.S. policy on Syria and Iran. CAIRO, Nov. 26 (UPI) — Speculation persists regarding an emerging Egyptian-Russian military accord that may include the sale by Moscow of a package of weapons systems worth at least $2 billion. It would likely hinge on Saudi Arabia, a supporter of Egypt’s military-backed regime, underwriting a deal that would be a major boost for Russian efforts to regain influence in a changing Middle East as U.S. power in the region is eroding. The Saudis, the United Arab Emirates and its partners in the Gulf Cooperation Council have pledged $12 billion to Cairo and have delivered about $7 billion. The U.S. State Department released a report in January on world military expenditures and arms transfers. They present data up to 2005. Military spending as a percentage of GDP is often dismissed by anti-American “peace” institutes who claim to be more concerned with total military spending. But anybody who has ever put together a budget knows that you’re dealing with a finite amount of money to allocate across a variety of competing areas. How much of a nation’s wealth are you willing to take and devote toward military spending? Two percent? Five percent? Ten percent? Your answer says something about your overall priorities, which is why the GDP measure is valid and important. The U.S. is known for high military spending, but what is less widely known is the extent to which Islamic countries are willing to take the wealth of their people to commit it towards armies and weapons. They use their military power to threaten the existence of Israel, which is forced to spend its resources on defenses in response. The result? 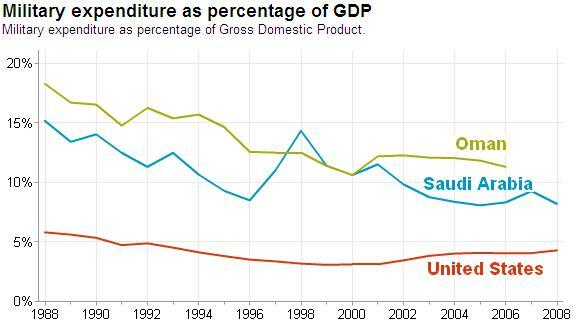 On a GDP basis, the Middle East spends a larger portion of its wealth on the military than any other region on earth. See similar findings from earlier Money Jihad coverage on Lebanon, Oman, Yemen, Jordan, and Saudi Arabia. Due to Hezbollah’s role in Lebanon’s new government, Congressman Howard Berman (D-Calif.) is calling for an end to U.S. military aid to Lebanon. Since the population and economy of Lebanon are intertwined with Hezbollah, it’s hard to disagree with Rep. Berman’s idea. Rep. Ileana Ros-Lehtinen (R-Fla.) has voiced similar concerns. 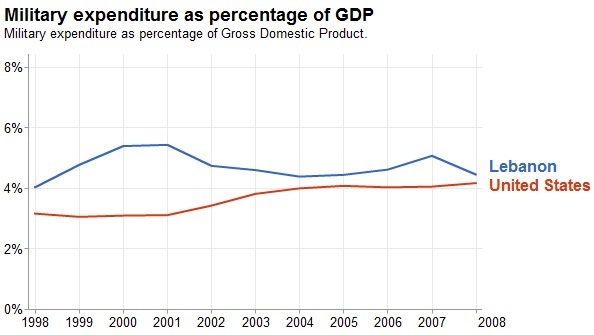 Of course Lebanon’s growing debt will make that a bitter pill for them to swallow, but as we have pointed out, their total military spending already exceeds that of the U.S. as a percentage of GDP. Read all about the proposed suspension of military aid to Lebanon at Israel Matzav. The chart was generated by Google using World Bank data. The usual disclaimer applies—I’m not equating military spending with Islamic jihad. Still, it’s remarkable how nations with majority of believers in the “Religion of Peace” tend to spend so much money on weapons and armies. It’s time again for another post comparing U.S. military spending to that of an Islamic country. Google has a nifty tool (which it didn’t seem to have a month ago when we looked at Yemen) that allows users to generate graphs of military spending as a portion of GDP for whichever countries one selects. Google uses World Bank data. One would be tempted to believe that during a global economic recession and an Iranian budget catastrophe, that the Islamic Republic would cut back on lavish spending to develop a nuclear program. That’s possible, but isn’t borne out by the recent history of the neighborhood. The parallel today is that Iran is also disregarding its economic woes in order to support expensive weapons programs and foreign intrigue. Nobody really knows how much money Iran is spending to arm itself, eventually to nuke Israel or threaten the West. The Cockburns’ book is dated but its lessons are fresh. Read my full review of Out of the Ashes on Amazon here.